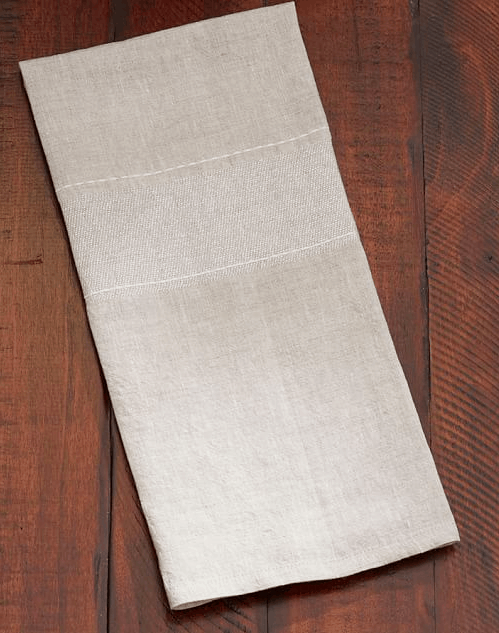 linen dish towels as wrapping (and as a usable gift)–on sale! The gift recipient can either take the burlap bag home, or we can save it to use again next year. 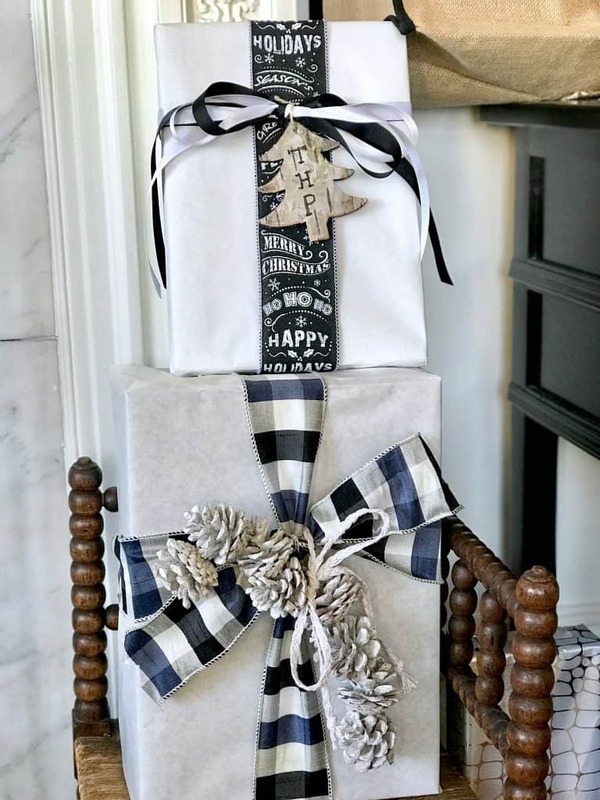 The white and burlap ribbon was actually from last year that I rolled up to re-use. Do you reuse your ribbon? 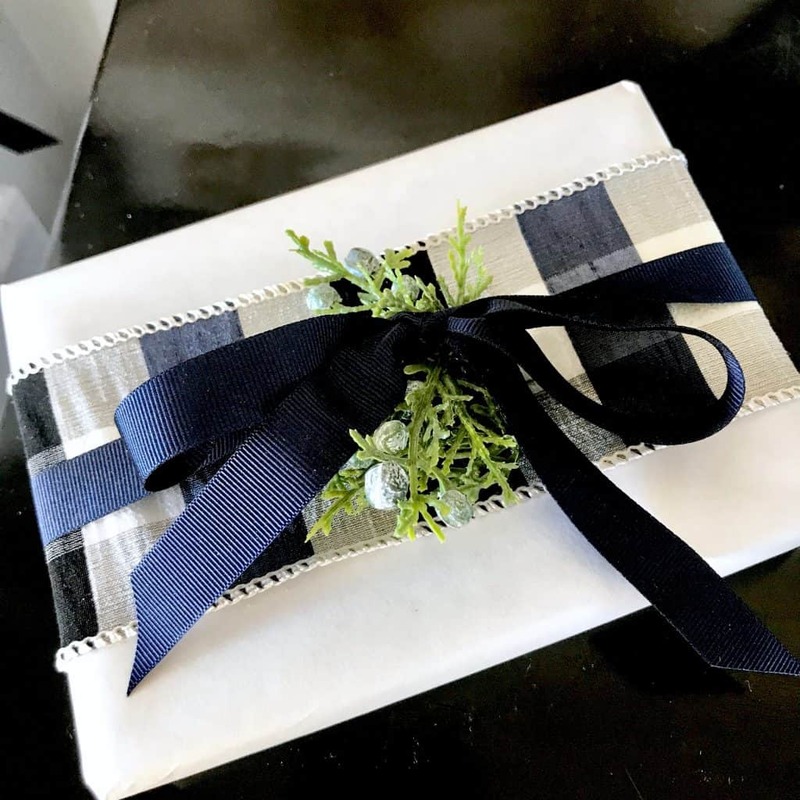 This is my favorite thing that I am doing this year, using linen dish towels as wrapping. I just tied the towels with rubber bands and then ribbon. In fact, Pottery Barn has lots of tea towels on sale right now. 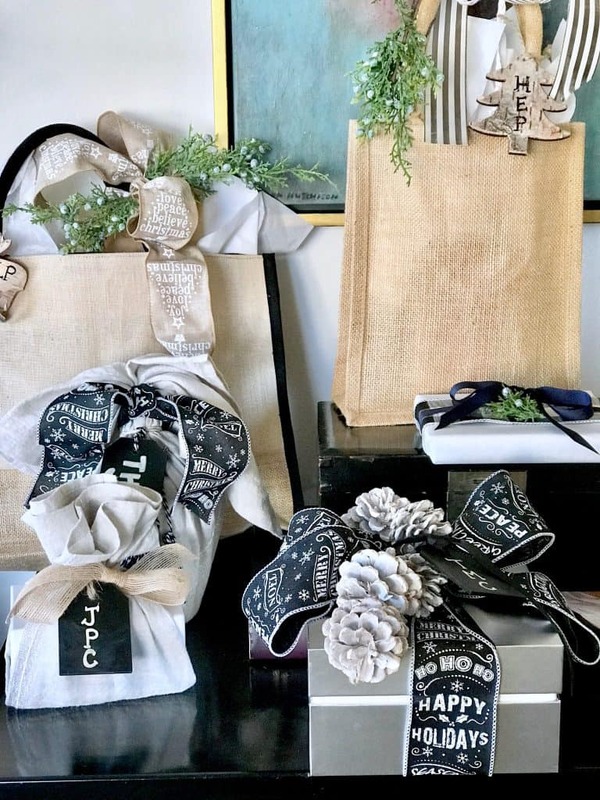 These reusable chalk and natural gift tags with written monograms can be used again next year. I’ll let you in on a little secret… I’m not that organized to have so many Christmas presents already. Some of these are birthday presents for my brother and son. But I’m on a roll for future presents with all the supplies! In fact, I like to turn on Christmas music and sit on the rug in here and enjoy the process of wrapping gifts for the people I love. I love it. Both how pretty they are and the thought behind them. Do you have any ribbon tying tips? I love using furoshiki techniques to wrap gifts in tea towels or scarves. A gift plus. 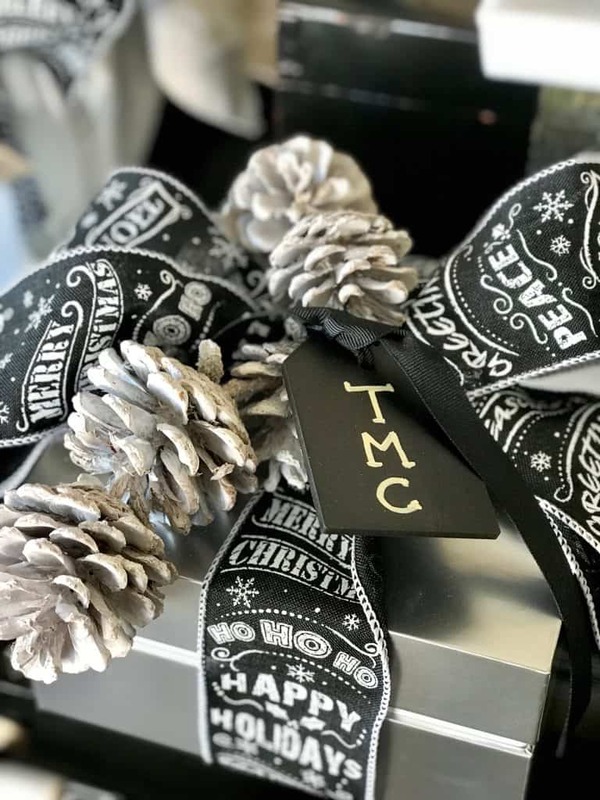 What great ideas and so practical and beautiful, but I knew they would be with your touch added to the process, Of course I absolutely love the black and white touches!! Very festive fun and your recipients will love having a new dishtowel. I am going to remember this for next year!! Great job my friend! I recycle gift bags year after year. I think they’re on their 7th year now. I also keep plain white or brown bags without logos that I get when I shop and use them as gift bags with a bit of ribbon. Love the idea of using dish towels. Looks like a fun group of posts. Will be visiting them all. I have re-used ribbon for years! My teenage boys even know to roll it up and put it in the “save” pile on Christmas morning! 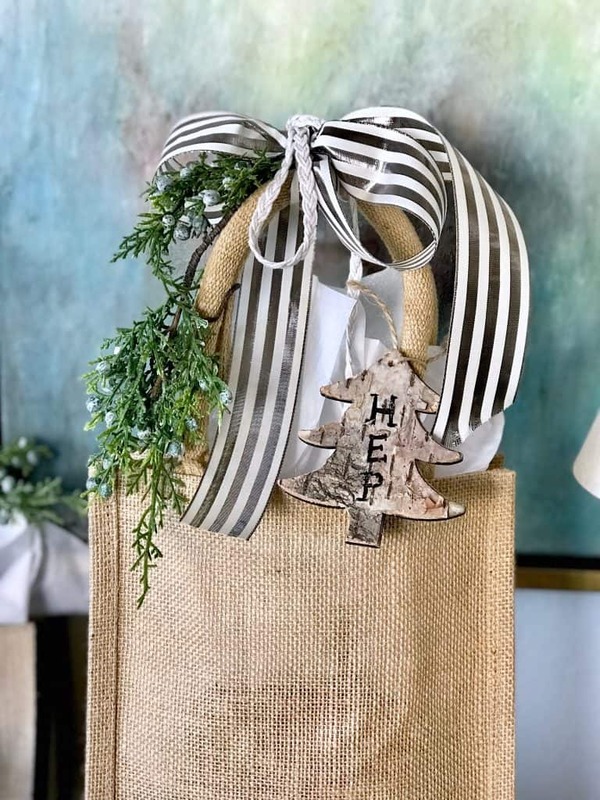 I also re-use bells, letters, faux berries, pine cones, and nice gift boxes (Target sells some from Sugar Paper that are so pretty they don’t need wrapping, just a ribbon). Target also carries a nice selection of bags, similar to the idea of your burlap examples. You will find these in the holiday section. I’m not a fan of all of the waste, either. Love your ideas! I wouldn’t want to open those pretty packages, Mary Ann! They’re beautiful as decor! 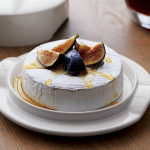 Love your great tips for ‘wrap’ without using wrapping paper. Your monogram tags are perfect too! Thanks so much for including me today, what a fun group and topic to kick off the holidays! Thank you for posting these eco friendly ideas! I, too, have stopped buying wrapping paper and my family just reuses the same bags over again each year. We reuse ribbons, too. My brother-in-law had a friend sew cloth bags made out of lovely holiday fabrics one year and he reuses those each year. There’s enough waste in packaging that comes from the gifts we give, so it helps to do what we can to keep stuff out of the landfills. I re-use the ribbon……….have not BOUGHT RIBBON IN YEARS!!!!!! 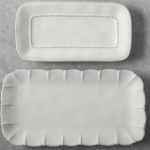 Mary Ann I love the dishtowel idea! 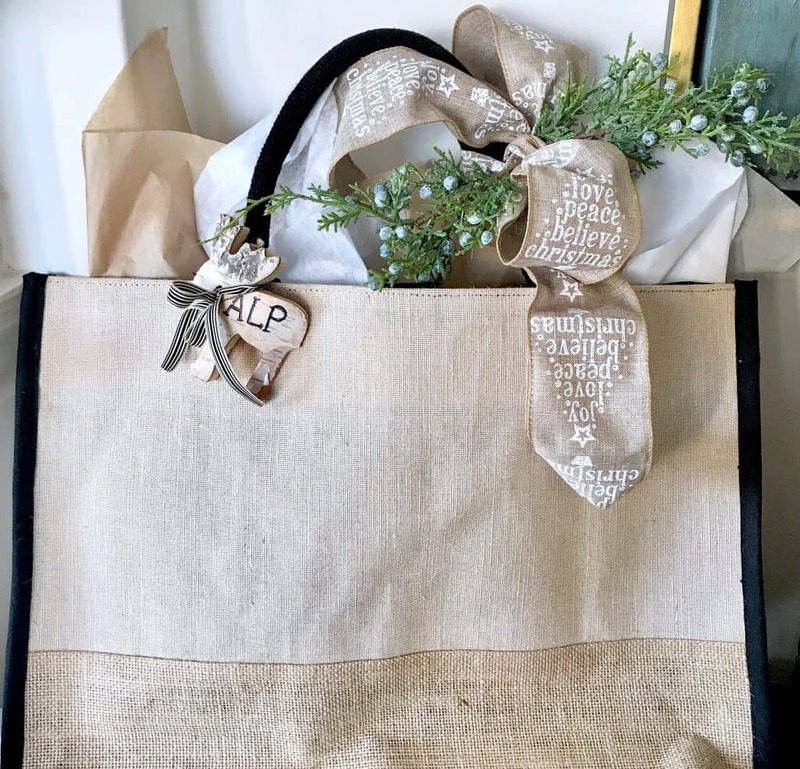 And the burlap bags….so pretty and environmentally friendly! 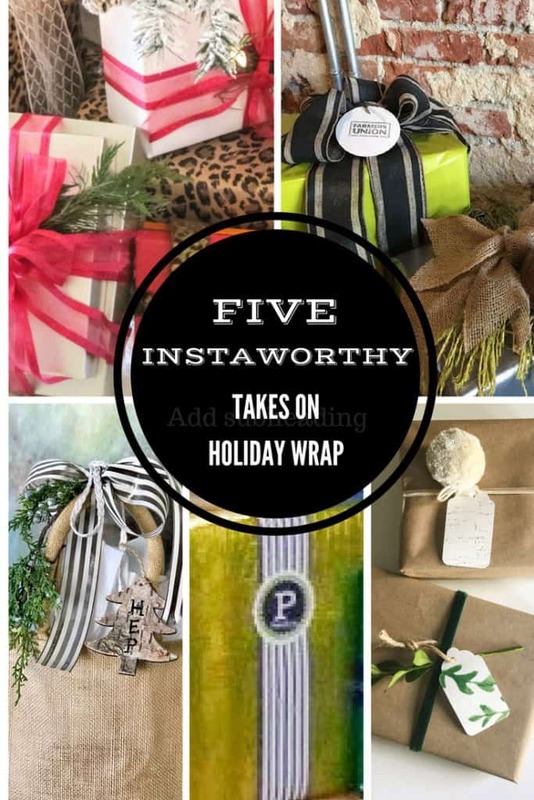 You have me thinking about alternative wrapping this year……thanks for the ideas! Hope you had a wonderful Thanksgiving! Thanks, Lisa. Happy Thanksgiving to you!! I love using tea towels for wrap. It’s super easy to make a bow or tie out of a second one, to make a pair. 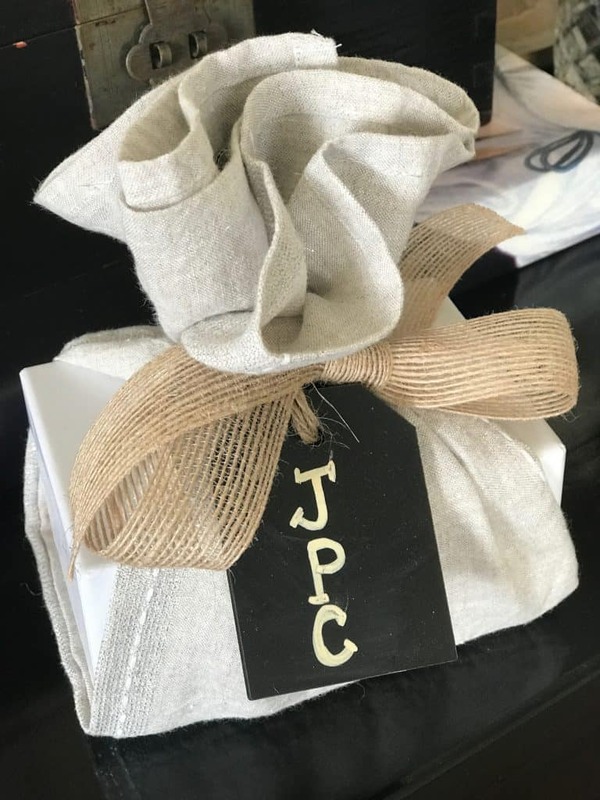 It also offers a little cushion if it has to go somewhere to be delivered – great for wine especially if you’re transporting host(ess) gifts while making the rounds to parties, etc. Your packages are so pretty, all of them – you are a constant source of inspiration. I think I’m going to buy some more tea towels!! All sooo pretty. I already feel like I’m behind getting it all done ; (( I have started my to-do list with these great ideas! Wrapping paper is so expensive and it is really sad it all goes in the trash so quickly. I’ve always had a passion for gift wrapping, so I love all of your beautifully wrapped packages. Lots of great ideas! I love creative gift wrapping. 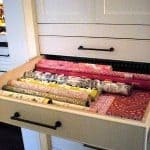 Have special drawers for beautiful papers. 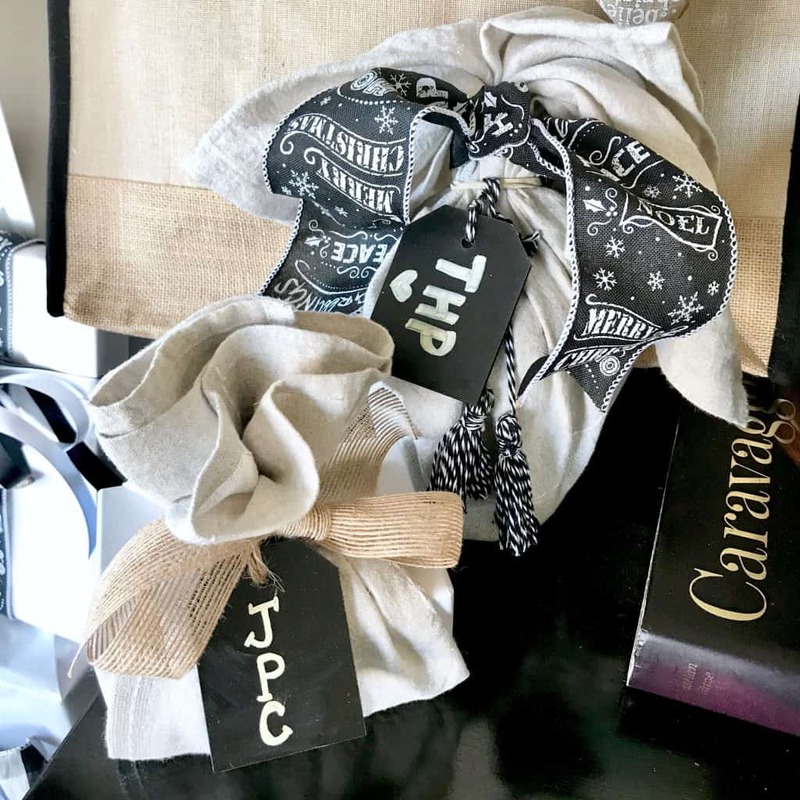 Love your use of tea towels as wrapping paper. I go to Ikea for tea towels and use them for napkins. Gorgeous with a capital G! 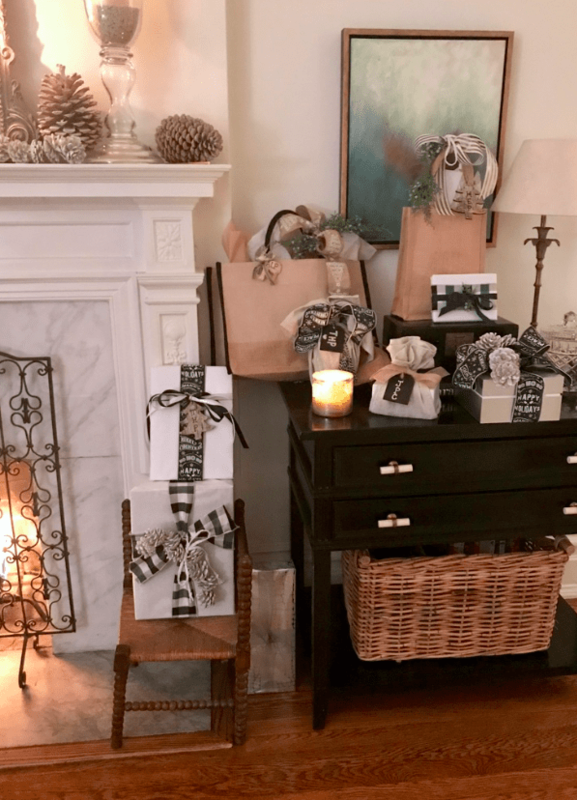 I am officially inspired…..I too get into my giftwap, it can really elevate the gift giving experience. Hope your holidays are off to a merry start! Fantastic idea! I am going out to get some burlap bags today! Of course you know how much I love that color scheme 🙂 Off to check out the others!